Hewlett-Packard has recently launched the line of printers, which will suit individual home use and businesses. The printers from this line will help consumers implement their creative photo printing abilities and help small offices deal with business-related documents. HP Envy 7640 e-All-in-One (just as the two other gedgets) doesn’t need a PC and can be operated right from a mobile device, smartphone or a tablet. The model possesses such fine new features as a dedicated photo tray, automatical duplex printing and an automatical feeder for up to 25 pages. 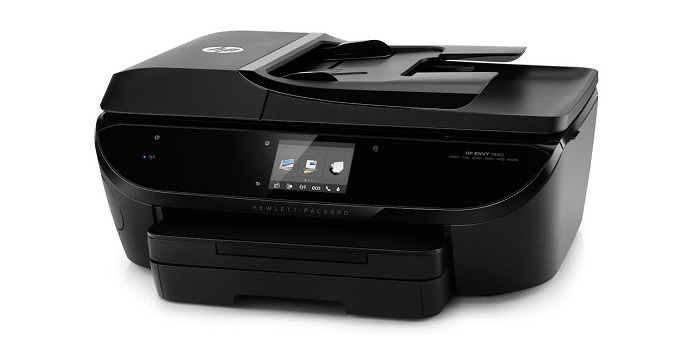 Another one—the HP Envy 5640 e-All-in-One—is capable of the high print speed of up to 12 ppm. The third model—the Officejet 5740 e-All-in-One—is aimed for home and small offices and produces clear text as well as vivid images for more professionally looking documents. HP has also announced changes in its Ink plan. The named printers participate in the program, which allows users to order cartridges while the previous ones are still in use. The program is available in the US for a monthly fee, counting by not the number of cartridges, but by the amount of printed pages per month. This entry was posted on Tuesday, August 26th, 2014 at 11:02 pm	and is filed under HP, multifunction. "3DPrinterOS: World Uniting Cloud Service"